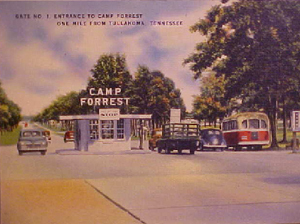 Camp Forrest was located in Tullahoma, Tennessee, a rural area approxi-mately 70 miles south of Nashville. 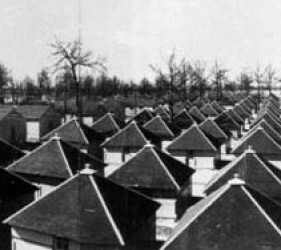 Its tenure as a internment camp began in May 1942. 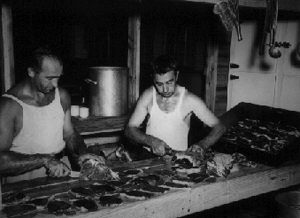 The average population was 200 men, mostly Italians, but in November, 600 German internees arrived. The peak population was over 800. As reported by John Heitmann, Ph.D. in a paper presented in 1998, one arriving internee recalled that they were met by troops who had cordoned off the train station. They had a lineup and were transported in trucks with mounted machine guns. 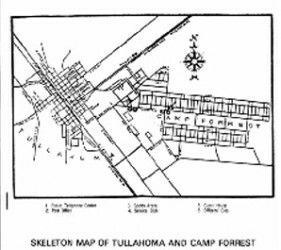 The men were and organized into “gangs” of 225 each and housed in green wood 4-man huts with large gaps in the paneling, which made for chilly winters. 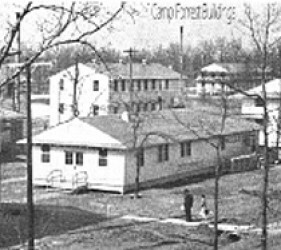 Dr. Heitmann reports that Camp Forrest was very much a military camp, and the internees were viewed more a prisoners of war than civilians. 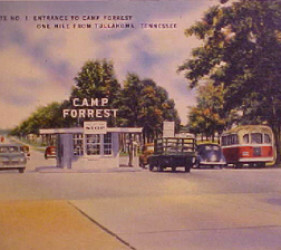 They were expected to comply with certain camp “courtesies” from the time of their arrival which included standing at attention in the presence of an officer. 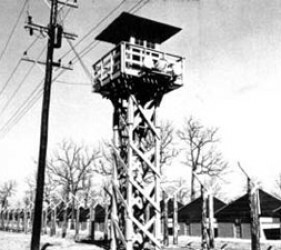 Mr. Ebel reports that he learned upon his arrival in March 1943, that a jittery serviceman shot an internee from a guard tower, when the internee approached the tower in what was believed to be a threatening manner. Mr. Ebel never knew if this was true, but he was cautious. 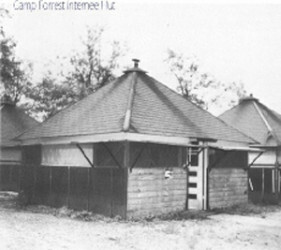 Camp Forrest’s population include a mix of internees, mostly in the political middle, but some more vocal concerning their national heritage. 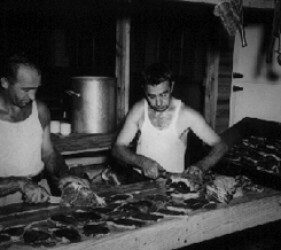 The internee population even included several Panamanian Jews, who encountered some difficulties. 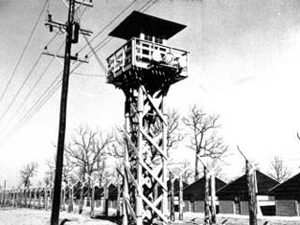 In early 1943, the German internees were notified that they were being transferred to make way for German prisoners of war. 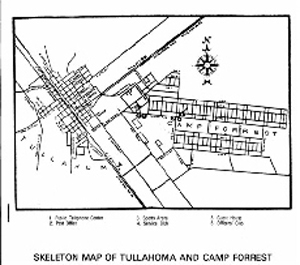 As expressed in the internee camp newspaper, The Latrine, there was much consternation about where the men would be transferred. 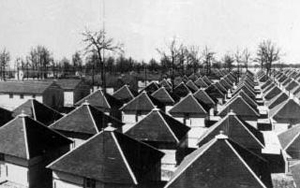 In May 1943, they were dispersed to a number of camps, many placed on a shuttered, guarded train which took them to Ft. Lincoln in Bismarck, North Dakota. 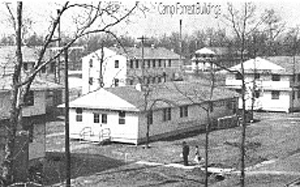 Others were sent to join their families in Seagoville and Crystal City, Texas. (“Enemies are Human,” a paper presented to the Dayton Christian-Jewish Dialogue, May 10, 1998, by John A. Heitmann, Ph.D., Professor of History, University of Dayton.) Recent visitors to Camp Forrest report that little or nothing remains on the site.